at a monitor setting of 1024 x 768 pixels. A HOLE IN JUAN is a work of fiction. Names, characters, places, and incidents are the products of the author’s imagination or are used fictitiously. Any resemblance to actual events, locales, or persons, living or dead, is entirely coincidental. Library of Congress Cataloging-in-Publication Data Roberts, Gillian. 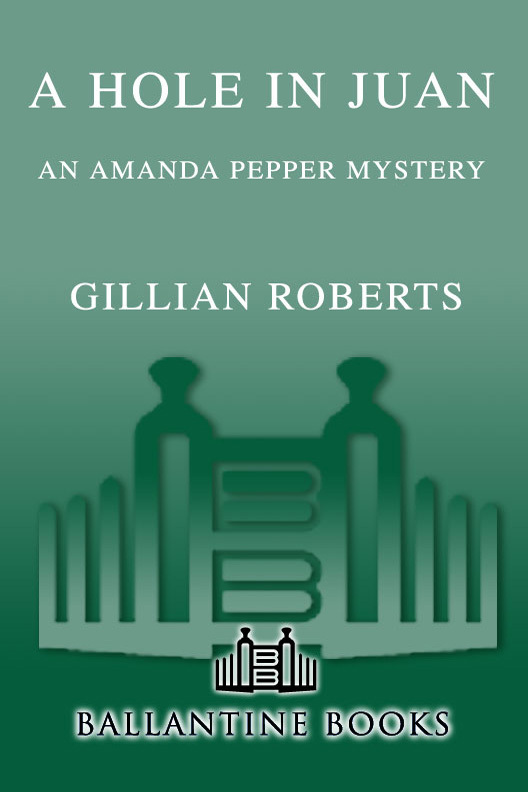 A hole in Juan : an Amanda Pepper mystery / Gillian Roberts. 1. Pepper, Amanda (Fictitious character)—Fiction. 2. Preparatory school teachers—Fiction. 3. Women teachers—Fiction. 4. Halloween—Fiction. 5. Philadelphia (Pa.)—Fiction. I. Title. This is for Henry Aaron Greber. So is anything else he wants. Many thanks to clever Christine Day for coming up with the title for this book as well as to the crew who helped me fill the holes in my education and put that hole in Juan: Carol Shmurak, Tom Griffith, Karen Tannert, Andi Schechter, and Camille Minichino. Thanks, too, for all the other suggestions from Dorothy L’ers whose generously shared collective knowledge is awe-inspiring. Still more gratitude to a trio of talented writers whose thoughtful comments and suggestions were, as always, in-valuable: Jo Keroes, Louise Ure, and Marilyn Wallace. As Wilbur told Charlotte, “It is not often that someone comes along who is a true friend and a good writer,” and here I am, blessed with three such women. Always, for too many reasons to ever list, besos y abrazos, Roberto, and (decades now!) of amazed appreciation to my allies in these felonious pursuits, Joe Blades and Jean Nag-gar. Any “holes” in Juan are mine—but lots more flaws and stumbles are now among the missing thanks to all these wonderful people. The week already felt long. I lurched out of bed, not exactly greeting the day. Insanity of sorts is part of any high school, but lately Philly Prep’s version seemed more ominous. Something more serious was in the air, a tension, or subliminal rumbling. I thought of the animals who’d felt the undersea earthquake and anticipated the tsunami, saving themselves by running for the safety of the hills. I’d have done the same if only I could locate the hills. I had spent too much time lately obsessing about it, as if gnawing at nothingness would somehow reveal a solid center. Mackenzie had just about convinced me I was imagining the problem, or at least exaggerating it. After all, I spent my work-week with adolescents, their mercurial moods, their brains drowned in hormones. I dragged myself to the bathroom and washed and dressed and tried to believe he was correct, and I was inventing a problem. I had to change my standards of what constituted normal and okay. The phone rang, and I raced to answer it. I had a sleeping visitor on the sofabed and didn’t want to wake him. It was Carol Parillo, a Philly Prep math teacher and friend. She sounded as if she were phoning from a submarine. Given how I felt about school lately, spending extra time with the students was the last thing I wanted, but she sounded so wretched I couldn’t refuse. I simply prayed for a miraculous cure for her. “That phone call . . .” I broke the news as gently as I could. He did not jump up and down in jubilation at the idea of chaperoning a school dance. I should have waited till we’d had our coffee. “Remember the ‘whither thou goest’ part of the marriage vows?” I searched for my shoes. I suspect that when Macavity finally activates himself, he phones the neighbors’ tabbies, Siamese, Manx, and Persians to compare the deadlines, pressures, billable hours, exams, com-mutes, and alarm clocks their humans endure versus their own self-centered, sensual existence devoted to enjoying the comforts for which their people labor. “And they think they’re the smarter species!” one will say, triggering a round of feline hysteria. My mother-in-law declared herself a witch, or Wiccan, but from what I’d seen, her professed magic seemed indistinguishable from common sense and keen observation. But who knows? Maybe that’s what magic is. Personally, I thought she was a smart woman who, faced with eight children plus strays taken in for years, decided to be more effective by claiming to be a witch. I’m not sure anybody ever actually believed it—I’m sure Mackenzie does not—but they all tacitly agreed to behave as if they did. So her strategy worked, which definitely is magic. “Things always got stirred up around Halloween,” he said. My mother-in-law’s wardrobe has the palette of a psychedelic nightmare and since she finds few ready-made pieces that please her, she designs and sews her dramatically draped garments. The idea that she’d wear a pointed hat and shapeless black gown—let alone the green makeup—was beyond insulting. “Even without a witch in the family, I’d hate costume parties,” he said. A cop’s rather narrow worldview, even if he was now a full-time student and not a homicide detective. He stood in front of the mirror, studying his image. This was part of his morning routine. Part of my morning routine was watching him watching himself. He claimed he was making certain his clothing matched, wasn’t ripped or stained, and that buttons were buttoned, zippers zipped. I knew better. We were both admiring him. Not even under torture would he admit to such vanity, but I wasn’t about to torture him because I didn’t think he had to justify anything. The man was aesthetically pleasing, and the sight of him brightened my day, so why not his, too? No wonder he didn’t like costumes and disguises. “I’ll get our lunches ready.” I tiptoed out of our bedroom into the open space of the loft, padding silently past our house-guest. Our marriage—spur of the moment and informal though it had been, and not yet one month old—had given us a new solid-ity and status in Mackenzie’s enormous family. Translated, this meant that, like other family members, we now qualified as a great place to send anybody causing grief to his assigned unit. that village. They believe a change of scene is as good as long-term therapy, and it’s their habit to separate and rotate family members when necessary. Nobody had pointed out this small print in the marriage contract. I knew that while he was growing up, C. K. Mackenzie’s already huge family had often expanded. I never asked why extra children had landed there, some staying on for years, but apparently relocation worked as well as any other plan. Rotating family was a brilliant idea—in theory. In practice, it meant we were now saddled with a lovesick sixteen-year-old Iowa high-school dropout named Pip. “a pip of a kid.” Pip had needed time out from his mother, C.K.’s sister Lutie, who was between spouses and didn’t feel equipped to continue waging battle with her son. His heart had been broken by one Bunny Brookings, and he could no longer see the point of remaining in a school so full of Bunny, or, in fact, any other school. Instead, he wanted to drop out and get involved with crime—on the side of good, he insisted, the way his idolized uncle, my new husband, had done. He’d be a cop, he said. Or maybe a crime scene investigator, a forensic something. Whatever he was destined to be, he wanted to begin the process of becoming it this instant. Pip had loved having an uncle who was a homicide detective. Now, he’d grudgingly accepted C.K.’s decision to leave the force and work on a Ph.D. in criminology, but he wasn’t pleased. He wasn’t fond of abstractions and theory, didn’t care about studying the roots of crime, or trying to figure out how to prevent future crimes. He wanted chases and shoot-outs, but he was settling for recollections of crimes past. Stories about C.K.’s current moonlighting as a PI were a decided letdown. on one Berta Polley, who claimed complete disability from a supermarket slip on a lettuce leaf. She was, she said, confined to her bed with excruciating back pain. The market’s produce manager insisted that the woman had staged the fall, and had done it slowly and comfortably. “More like sitting herself down on the floor, if you ask me,” he’d said. We were taking turns waiting for Berta to appear at her door, demonstrating the ability to descend the stairs and to walk, but so far there’d been no sign of her, and it appeared to be possible that the only lying she was doing was, in fact, in bed. Needless to say, sitting and staring at nothing in a bloodless, eventless investigation did not meet Pip’s minimal standards. I tiptoed past the sofabed in my stockings, not wanting to wake him because his energy blast in the a.m. was too much for me. When he slept, he looked comatose, all skinny six feet of him almost adorable, but the instant he awoke, he was alert and unfortunately back to obsessive interest in blood and guts.